Please check the SDRAM connection. If problems persist contact Tech Support. Do you know what should I do? 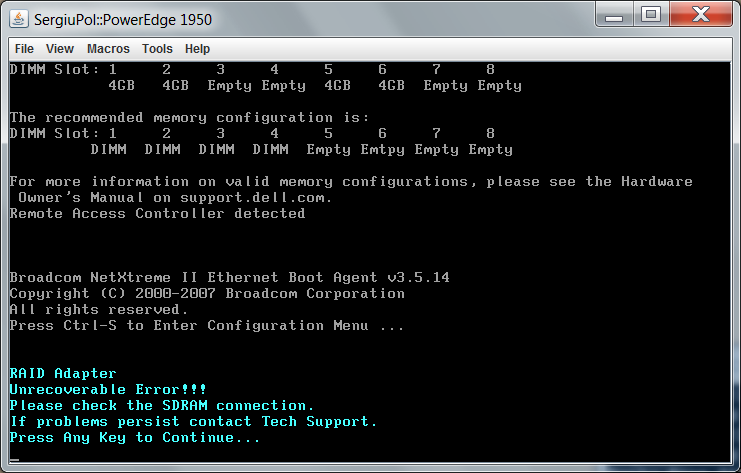 Is the RAID controller dead? WIth this error, the issue is generally a conflict between hard drives and controller regarding matching metadata information. I would advise unseating the drives from the unit, attempting to boot to the controller to see if the error persists. If no error and can get into the RAID controller, power down and place drives back into the unit. If an error still persists and are unable to get into the RAID controller, then the next step is to reseat your RAID controller and DIMM. Once drives are back into the unit, power up and see if the error persists. If no error allow the boot to continue. If the error comes back, what you will need to do is then unseat the hard drives again and clear your array configuration. Be sure to do that with the drives disconnected The add the drives back in, boot to the controller and the configuration should pull in from the hard drives.